The LG Spectrum might not be the most popular model available at Verizon, but it is getting a sequel. 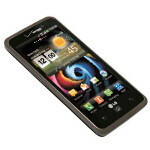 As we told you earlier, the LG Optimus LTE II will be getting the Spectrum name at Verizon and will be called the LG Spectrum II. But life is not over yet for the OG LG Spectrum. Last weekend, we passed along the story of an LG support rep who said that the LG Spectrum was all set to receive its Android 4.0 update and was merely waiting for Verizon to give the thumbs up sign. Confirmation of the rep's story comes directly from Korean manufacturer LG. On the LG website is an updated User's Guide for the LG Spectrum and on the guide is some references to Ice Cream Sandwich and the features that come with the update such as multi-tasking. 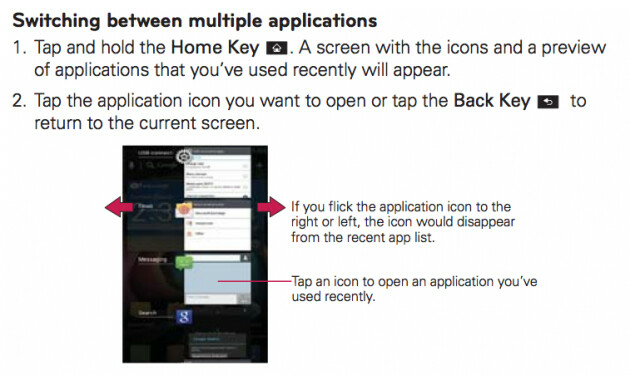 Updating the Guide would seem to indicate that LG has done its part. It would be great if we had some idea of when to expect Android 4.0 on the LG Spectrum, but as we know, carriers are a mostly unreliable lot when it comes to pin-pointing an exact date for anything except when a customer's monthly invoice is due and when you're entitled to upgrade your current phone. The lucid manual is also updated to show ics. i look forward to getting some hands-on time with these updates. LG has one of the better ICS builds out there. I notice you use "OG" alot in your articles, I know what it means but I don't think most people that frequent this website knows what it means since it is not commonly used on here. I know it from sneaker sites/blogs/forums for meaning the original. If this was a sneaker website then it would be acceptable since it is commonly used. Im waiting for update for My optimus 2x!